MOSCOW, Russia (CNN) -- Russia's president launched a verbal volley at Georgia's leaders on Monday, as Georgia hit back with renewed accusations that the Russian invasion was premeditated. 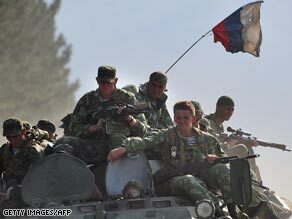 Russian soliders on patrol outside the Georgian city of Gori on Monday. President Dmitry Medvedev said: "The world has seen that even today, there are political morons who are ready to kill innocent and defenseless people in order to satisfy their self-serving interests, while compensating for their own inability to resolve complicated issues by using the most terrible solution -- by exterminating an entire people. "I think that there should be no mercy for that. We will do our best not to let this crime go unpunished." He was speaking at a visit to the military headquarters at Vladikavkaz, near the Russian-Georgian border. Each side accuses the other of "ethnic cleansing" during the conflict over South Ossetia, which erupted August 7. In Washington, Georgia's ambassador to the United States said the Russian push into Georgia the following day had been long planned. "You just don't move more than 1,200 tanks and 15,000 soldiers into a country within 12 hours without previous planning," Ambassador Vasil Sikharulidze said. The conflict began more than a week ago when Georgian troops entered the breakaway territory of South Ossetia to attack pro-Moscow separatists. Russia responded by invading the country on August 8, prompting heavy fighting with Georgian forces that spread to another breakaway territory, Abkhazia. The Georgian troops withdrew and Russian forces took control of several areas -- prompting an international outcry. After diplomatic efforts led by France on behalf of the European Union, Georgia and Russian signed a cease-fire. France is the rotating EU head. "We're talking about pulling our troops away to the borders of South Ossetia. They will not be on Georgia territory," Gen. Anatoly Nogovitsyn, the Russian armed forces deputy chief of staff, said Monday. White House spokesman Gordon Johndroe said Russia needs to start pulling back "without delay," saying the "Russians have committed to withdrawing, and they need to withdraw. And so that is what we are looking for." A Georgian Interior Ministry official said there have been "no signs" of a Russian troop withdrawal despite Russia's pledge to start moving back on Monday. Witnesses said Georgian police cars had been blocking the road and the police told Russian tank commanders that they were carrying out orders. The tanks proceeded to plow ahead, damaging the police cars in the process. The Georgian Foreign Ministry said a Russian armored column had been seen moving a bit deeper into Georgian territory, traveling south from Kashuri to Borjomi. Kashuri is about 10 miles (16 km) south of South Ossetia. Another column was moving north from the Kashuri area to Sachkhere. Nogovitsyn told reporters Russian troops were leaving Gori on Monday, the Interfax news agency said. He did not say how many troops were withdrawing or how many would return to South Ossetia or Russia. However, CNN journalists in Gori, near South Ossetia, said it was still under Russian control and there was no evidence the Russians were pulling out. Also, Russian tank and artillery positions were seen extending nine miles (15 km) south of Gori. Nogovitsyn said Russia was not yet moving vessels in the Black Sea from their positions near Georgia, but they would return to Sevastopol after the settlement of the conflict. He said Russia's deputy foreign minister had presented the U.S. ambassador to the country with a timetable of the events that led to Russia's actions and clearly indicated Georgia's responsibility. He said a prisoner exchange involving the transfer of 12 Russians and 15 Georgians had been set up. "We were all set and then the Georgians came up with a bunch of new requirements with no time for us to act so the time to exchange prisoners was interrupted," Nogovitsyn said. Georgia said Russia was spreading "false" accusations and that it was ready to pursue an exchange. The six-point deal gives no timetable for a Russian withdrawal, nor any other specifics, according to a copy of the agreement provided by Georgia's government. A U.S. defense official told CNN about evidence of Russian SS-21 missiles and launchers in South Ossetia. Lt. Gen. Nikolai Uvarov, a Russia Defense Ministry spokesman, disputed that, telling CNN that "no, they are not present." The U.S. official said while "Russian forces continue to consolidate their enclaves in South Ossetia and Abkhazia," they "are expected to slowly remove forces from Georgia." Diplomatic discussions continued Monday. Finland's Foreign Minister Alexander Stubb, representing the Organization for Security and Cooperation in Europe, was in Brussels, Belgium, to meet with representatives from the European Union, NATO, and the United Nations. The OSCE is working on a plan to increase its observers in the region to 100 people. Meanwhile, Human Rights Watch said there was "mounting evidence that Russian and Georgian military used armed force unlawfully during the South Ossetian conflict" and it emphasized that this "highlights the need for international fact-finding missions in Georgia." "This conflict has been a disaster for civilians," said Rachel Denber, Human Rights Watch's Europe and Central Asia deputy director. The conflict has devastated parts of Georgia and South Ossetia, with many casualties reported. The U.N. refugee agency said more than 158,000 people had been displaced by fighting in Georgia, mostly from districts outside the breakaway territories where the fighting began. CNN's Bruce Conover, Jill Dougherty and Max Tkachenko in Moscow, Fred Pleitgen in Tbilisi, Georgia, Tommy Evans and Michael Ware in Gori, Georgia, and Barbara Starr at the Pentagon contributed to this report.